Discover our different workflows for TILs and find the one that fits your experimental needs. Freshly dissected tumor tissue can be stored for up to 48 h without compromising cell viability or causing unwanted effects like cell activation or apoptosis using MACS® Tissue Storage Solution. Secretion of IFN-γ is one of the hallmark functions of antigen-specific T cells encountering the respective tumor antigen. Combined mechanical/enzymatic processing of TILs with the gentleMACS™ Dissociator is gentle to cells and results in profound secretion of IFN-γ upon tumor cell coculture. Functional analysis of expanded TILs. TILs were generated by combining mechanical/enzymatic dissociation of tumor tissue on the gentleMACS Dissociator. Tumor samples from two donors were processed with both tumor dissociation methods in parallel to allow for direct comparison. Cell culture supernants were analyzed for IFN-γ by ELISA. Data are means±SEM of three experimental replicates (*p < 0.05; ***p < 0.001; two-way ANOVA with Bonferroni post-test correction). Standardized processing of tumor samples using the Tumor Dissociation Kit (TDK) together with the gentleMACS™ Dissociator enhances reproducibility and was essential for recovery of key populations of TILs. 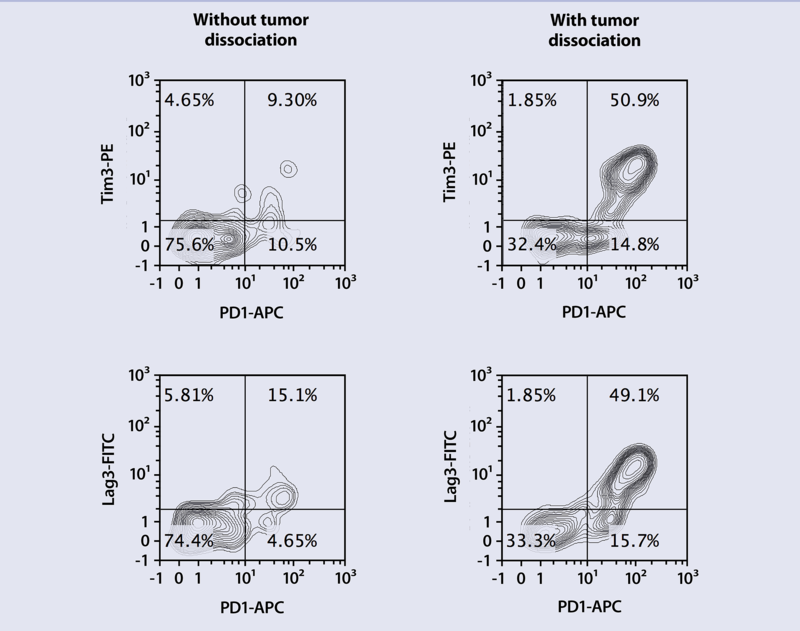 B16-F10 tumors were collected and dissociated using the gentleMACS Octo Dissociator in the presence (A) or absence (B) of Tumor Dissociation Kit enzymes. Cells were subsequently labeled with REAfinity™ Antibodies. Gated populations show viable cells. The amount and composition of tumor-infiltrating leukocytes (TILs) is highly variable, complicating the analysis of individual subpopulations. When working with large cohort sizes, even immunophenotyping of TILs by flow cytometry is time consuming and data processing highly work intensive. Therefore, pre-enrichment of TILs is highly desirable to increase the sensitivity of analysis and save time and effort during flow cytometry. Using CD4+, CD8+, and pan T cell specific MACS MicroBeads for magnetic cell isolation (MACS® Technology) directly from dissociated tumor tissue delivers high purities of isolated TILs above 80%. This pre-enrichment of TILs greatly reduces time and costs of downstream analysis while the quality of data analysis significantly increased. Tumors derived from B16-F10 (left and center columns) or B16-OVA (right column) melanoma cells were inoculated subcutaneously into the right flank of C57BL/6 mice. 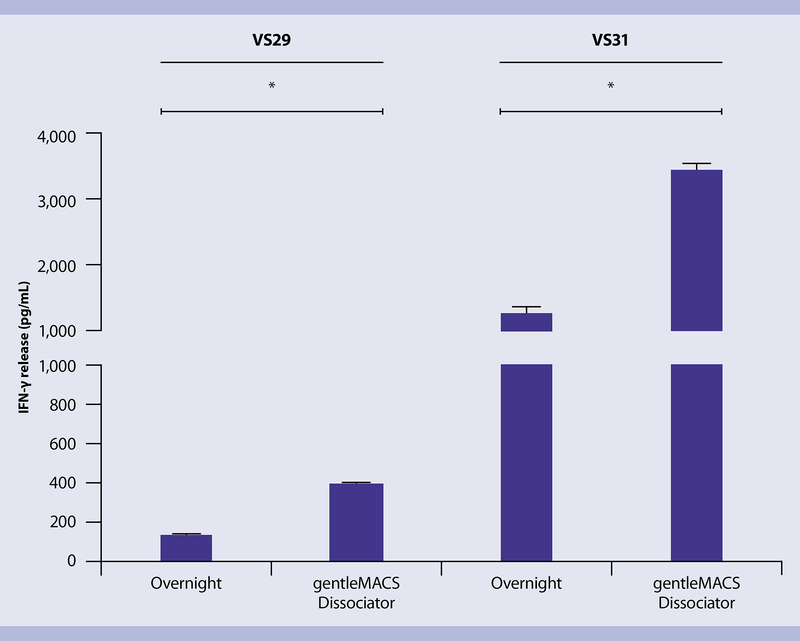 After 11-15 days, tumors were collected and dissociated using the gentleMACS Octo Dissociator and the mouse Tumor Dissociation Kit (TDK) optimized for epitope preservation. CD4+, CD8+, and pan T cells were isolated using the mouse CD4 (TIL) MicroBeads, CD8 (TIL) MicroBeads, and the CD4/CD8 (TIL) MicroBeads, respectively. 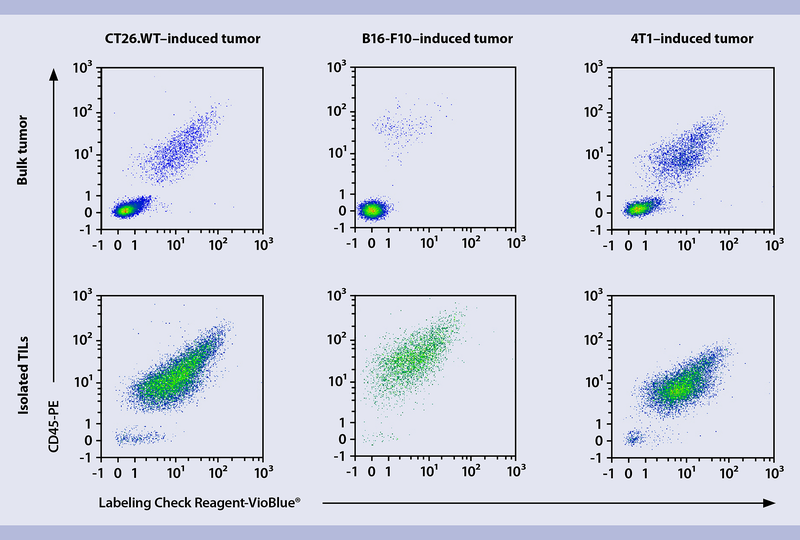 Frequencies of tumor-infiltrating T cells among living cells before or after isolation are shown for different tumor models, as assessed by flow cytometry. Isolation of TILs directly from dissociated tumor tissue can be improved by using the CD45 (TIL) MicroBeads for magnetic cell sorting. Pre-enrichment of TILs significantly improves subset analysis and does not affect the composition of infiltrating immune cell populations. Syngeneic mouse tumors derived from B16-F10 melanoma cells showed TIL frequencies of 2-4% among total viable cells after dissociation. CT26.WT cell-derived colon carcinoma contained 15-21%, and 4T1 cell-derived breast carcinoma 32-37% TILs. TILs were enriched to purities above 90% at yields above 70% for CT26.WT and 4T1 tumors, and purities above 80% at high yields above 95% for B16-F10 tumors. 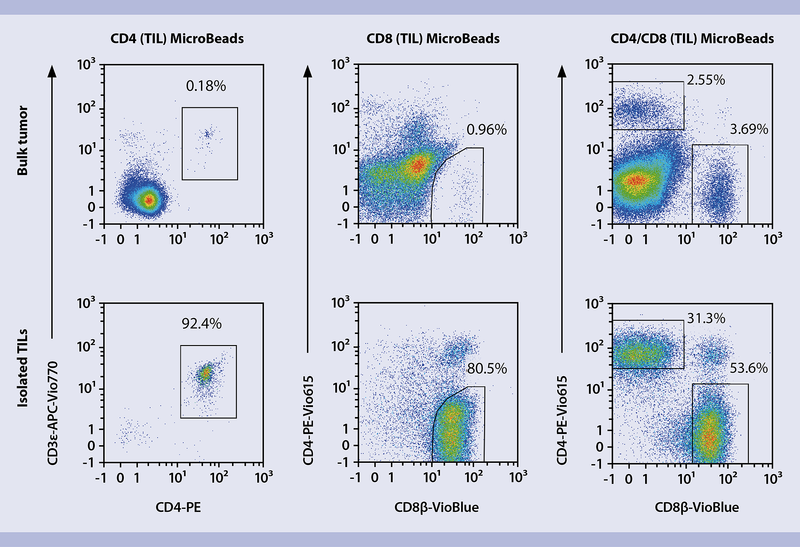 These short video protocols show the quick isolation of CD45+ TILs – either manual for less samples or fully automated for high-throughput cell isolation approaches. Watch how easy it is to separate tumor-infiltrating lymphocytes using MACS Technology. Watch how the MultiMACS Cell24 Separator Plus and the MultiMACS X can enhance your workflow of isolating CD45-positive tumor-infiltrating leukocytes. Phenotypic characterization of TILs by flow cytomety can be performed using optimized panels of fluorochromes-conjugated REAfinity™ Recombinant Antibodies. 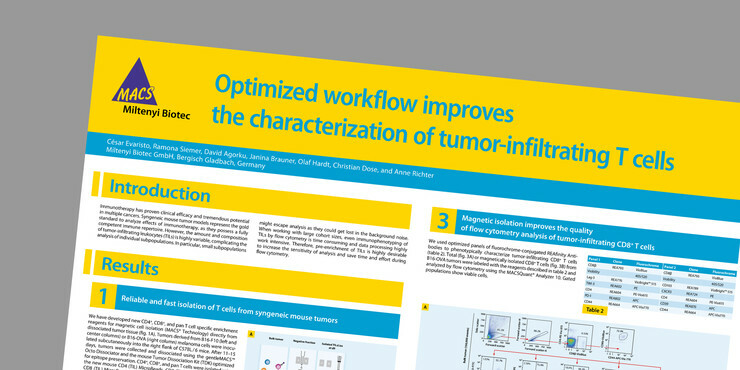 In addition, the scientific poster below gives a comprehensive overview on how to optimize single workflow steps for improved TILs analysis. Listen to the lecture delivered by Dr. Cesar Evaristo during Tri-Con 2017 at the Moscone North Conference Center, San Francisco, CA, and learn more about complete workflows for isolation and analysis of immune cells.